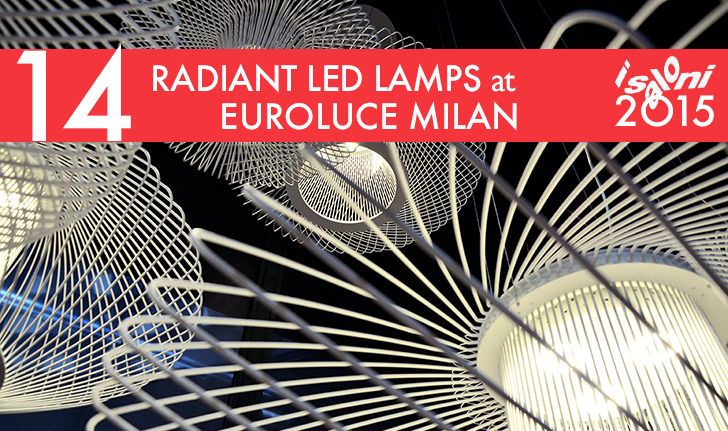 Euroluce returns again to Milan Design Week to showcase what is arguably the world’s most cutting edge lighting. Held this year at four pavilions at Rho Fiera Milano, the Euroluce exhibition represents many innovative and elegant lighting projects proposed by designers from around the world. The collections include works from famous and well-established artists to emerging talents. 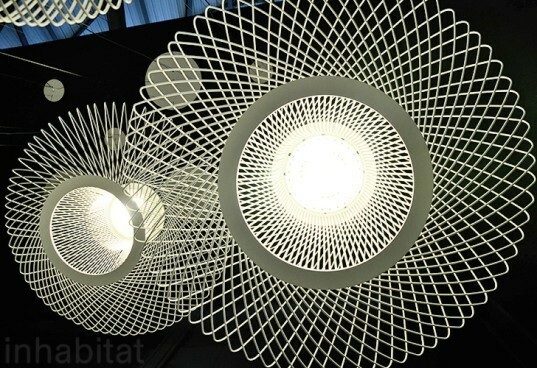 We’ve selected the most forward-thinking lighting ideas from this year’s Euroluce—read on to see them all! Paris-based artist Arik Levy proposed a series of “Oil Lamps” made with elegant silhouettes evoke images of traditional oil lamps. The iconic appearance belies its innovative LED technology. 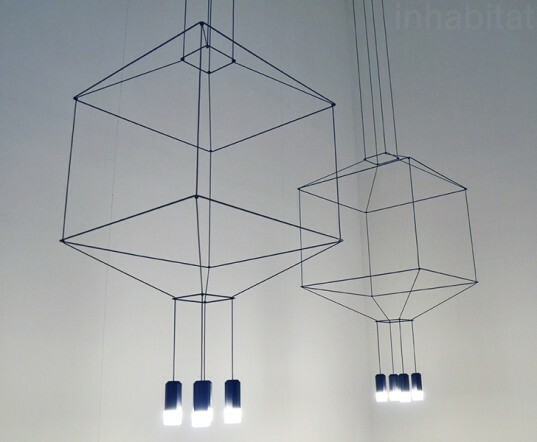 “Wireflow” designed by Arik Levy for Vibia in 2013 has won a number of prestigious awards such as the Best Line Work winner, Wallpaper Design Awards 2014, and Elle Deco International Design Awards 2015. 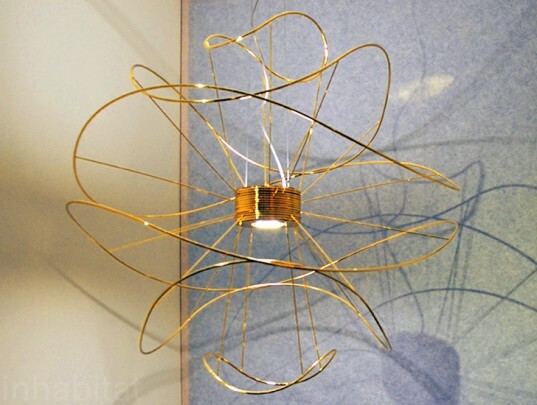 The design captivates viewers with its neat metallic structure, delicate form, and subtle outline of this lamp. Carlesso’s “Dame” design comprises artistic objects created to illuminate domestic space with a touch of magic. This hanging lamp casts a cozy and whimsical play of light and shadow thanks to its curved hooped structure. The lamp simultaneously casts its glow upwards and downwards. The “Light beam” project is a daring design that challenges the heaviness of marble. Suspended and filled with light, the stone appears to be weightless and effortlessly drift in the air. 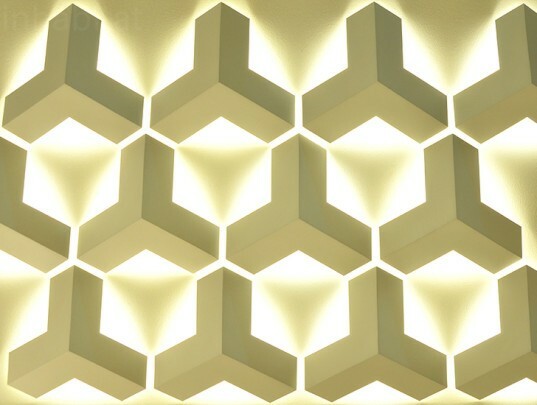 Ray is a modular component that envisions numerous possibilities on wall illumination arrangement. 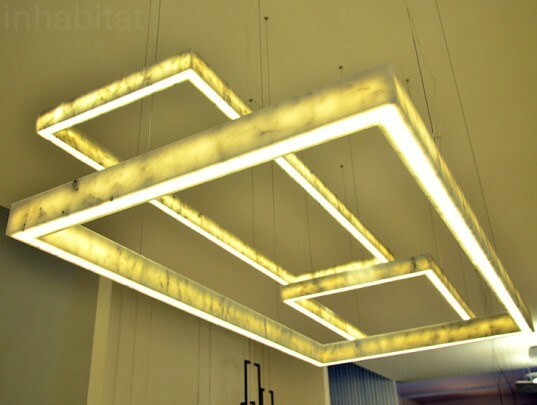 The fixture can be put in a special sequence to create an evocative pattern and a 3D illusion. 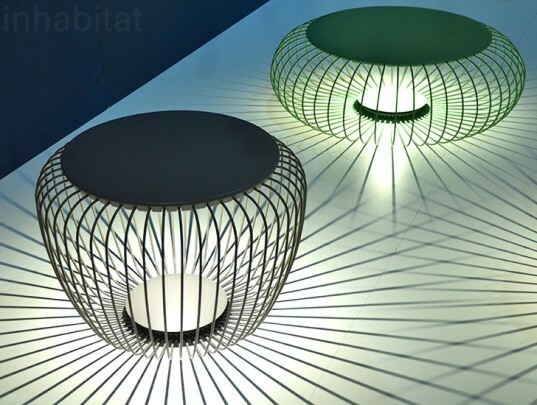 “Meridiano” is a hybrid object designed for outdoor spaces; it serves as a seat and a lamp. 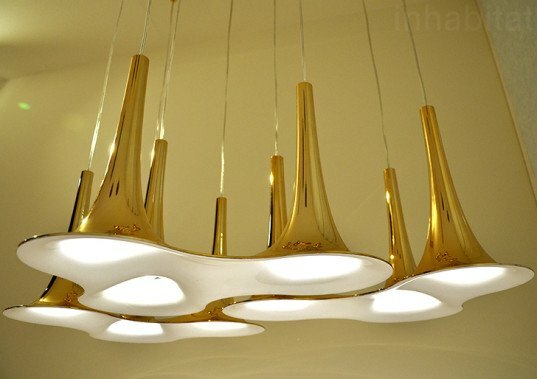 Designed by renowned New York-based industrial designer Karim Rashid, “Nafir” is a sculptural lighting design that recalls a row of trumpets lined like bunting stems. The LED lamp is available stand-alone or in groups of three. The lamp is also enchanting as a sculptural art piece even when it’s not turned on. Beluga is a minimal and elegant multisport that was designed to allow interior architects and designers to attach the lighting fixture at any desirable height. 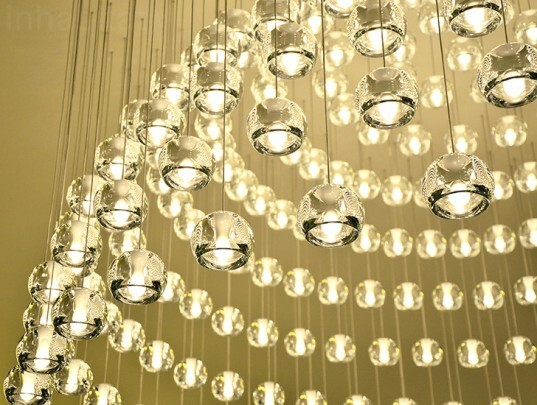 The flexibility of the lighting design offers an infinite number of lighting compositions. Treasure by Massimiliano Raggi is a table lamp that evokes the image of a jewel. The piece features a diffuser made from hand blown crystal with fine, decorative engravings and a top handle with a polished chrome finish. The lamp’s soft and intimate light creates a cozy atmosphere. Mussapi’s Imposible lamps evoke the image of floating clouds. The lamps are available in large sizes and are designed for large areas. Its graceful and virtuoso metallic textures and smooth silhouettes echo its delicate Venetian–style effect. The main characteristics of this lighting diffuser are the two different light intensities that this lamp can provide. In order to achieve this effect, the “Eyes” sphere was carved in three different points. 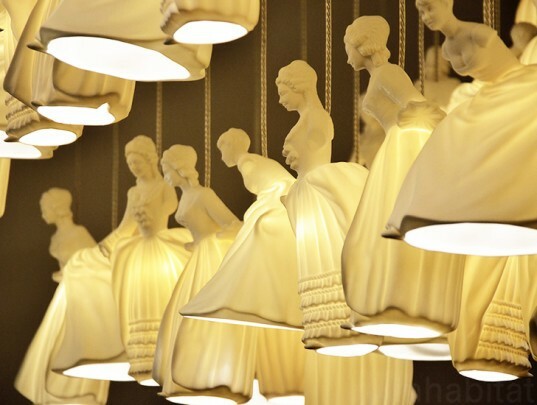 The “Melting Pot” appears as a set of many lampshades merged together. This collection comprises both hanging lamps and wall lamps. This wall lamp can be best defined as a work of art that mixes light and graphic design. 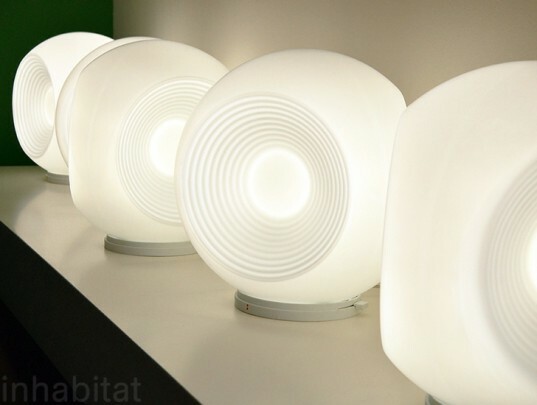 Employing “Set’s” pure geometries can create endless configurations of shades and lights. My Glorious God, let their be light!!! Oil Lamp by Arik Levy Paris-based artist Arik Levy proposed a series of “Oil Lamps” made with elegant silhouettes evoke images of traditional oil lamps. The iconic appearance belies its innovative LED technology. Dame by Carlesso Carlesso’s “Dame” design comprises artistic objects created to illuminate domestic space with a touch of magic. Hoops by Giovanni Barbato This hanging lamp casts a cozy and whimsical play of light and shadow thanks to its curved hooped structure. The lamp simultaneously casts its glow upwards and downwards. Light Bean by Inarchi The “Light beam” project is a daring design that challenges the heaviness of marble. Suspended and filled with light, the stone appears to be weightless and effortlessly drift in the air. Ray by Inarchi Ray is a modular component that envisions numerous possibilities on wall illumination arrangement. 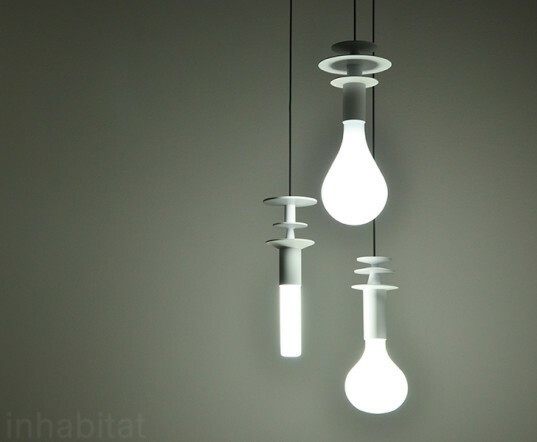 The fixture can be put in a special sequence to create an evocative pattern and a 3D illusion. Meridiano by Jordi Vilardell & Meritxell Vidal “Meridiano” is a hybrid object designed for outdoor spaces; it serves as a seat and a lamp. Nafir by Karim Rashid Designed by renowned New York-based industrial designer Karim Rashid, “Nafir” is a sculptural lighting design that recalls a row of trumpets lined like bunting stems. The LED lamp is available stand-alone or in groups of three. 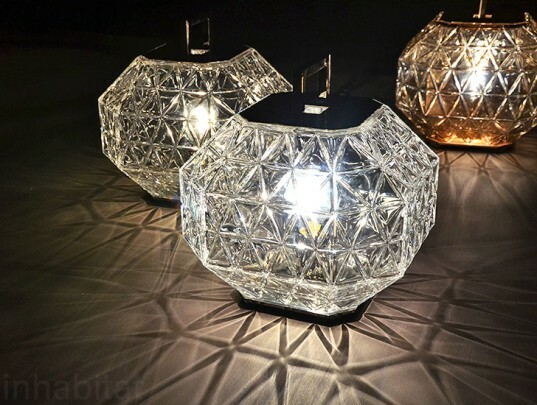 Treasure by Massimiliano Raggi Treasure by Massimiliano Raggi is a table lamp that evokes the image of a jewel. The piece features a diffuser made from hand blown crystal with fine, decorative engravings and a top handle with a polished chrome finish. Mussapi's Imposible lamps evoke the image of floating clouds. The lamps are available in large sizes and are designed for large areas. Its graceful and virtuoso metallic textures and smooth silhouettes echo its delicate Venetian–style effect. Eyes by Matali Crasset The main characteristics of this lighting diffuser are the two different light intensities that this lamp can provide. In order to achieve this effect, the “Eyes” sphere was carved in three different points. 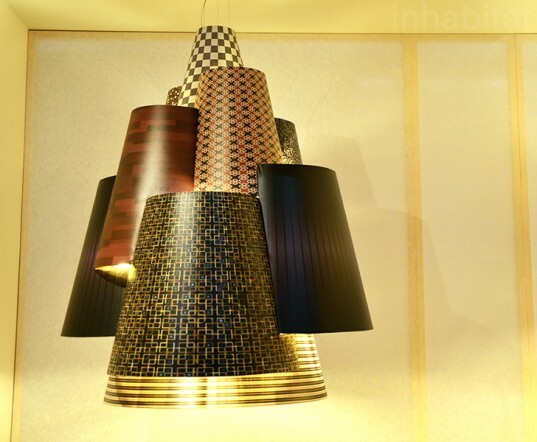 Melting Pot by Sandro Santantonio The “Melting Pot” appears as a set of many lampshades merged together. This collection comprises both hanging lamps and wall lamps. 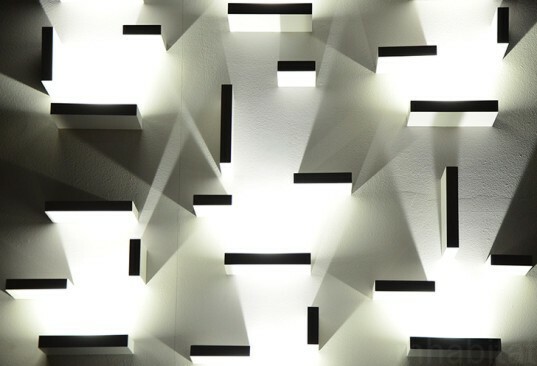 Set by XUCLA This wall lamp can be best defined as a work of art that mixes light and graphic design. Employing “Set’s” pure geometries can create endless configurations of shades and lights.